I wanted to share with you a new staple in your wardrobe! 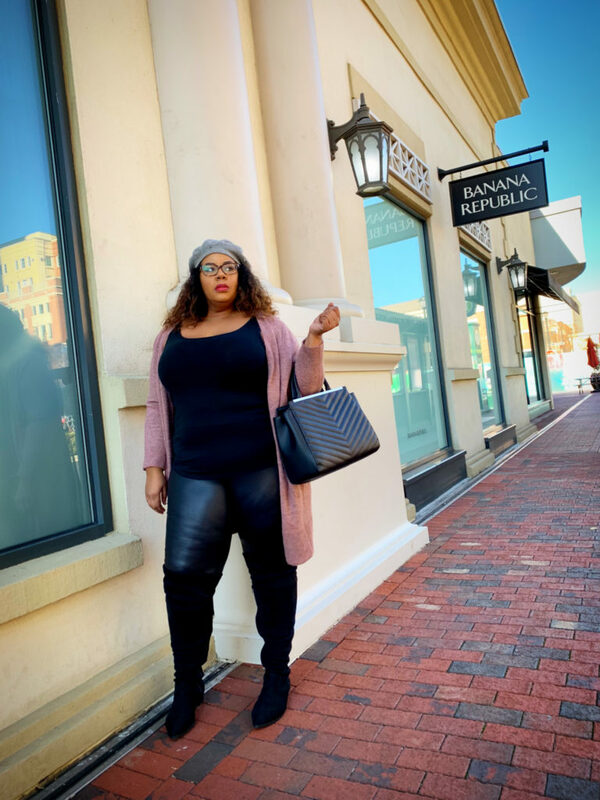 They are a pair of Faux Leather Leggings from DivaLux Boutique! 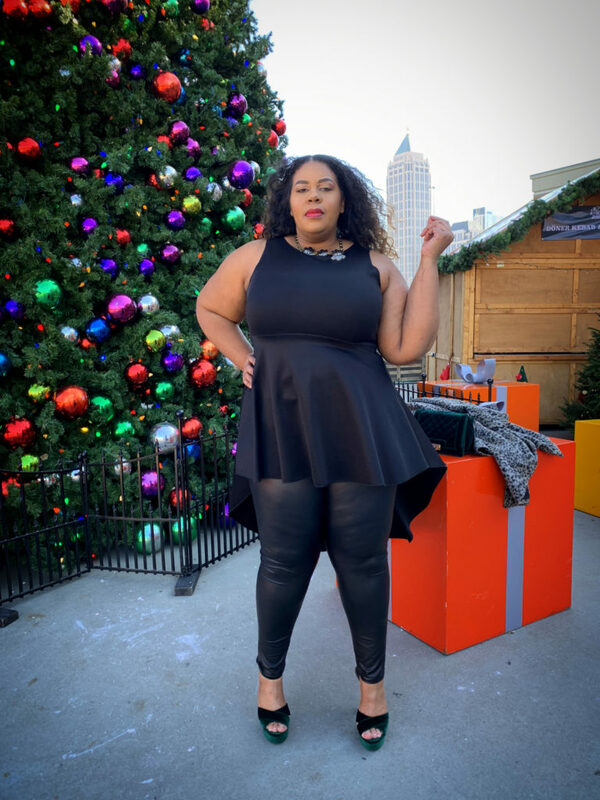 These Faux- Leather leggings are such a versatile piece that can take you from a super casual day of running errands, shopping and brunch for those Christmas gifts or a Festive Holiday party! 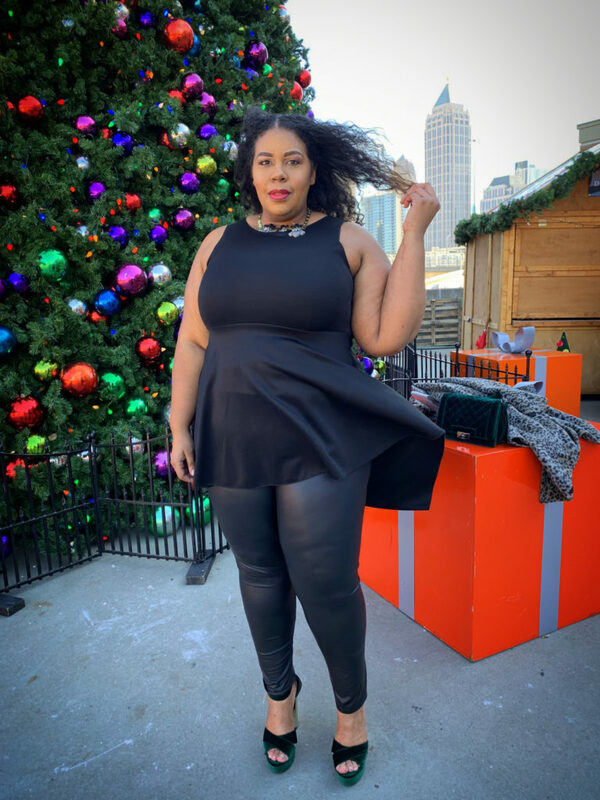 So I’m not going to waist any of your time, and show you 3 ways to wear these leggings that will have your comfortable and ready for the holidays! make sure you read to the end so you can score a sweet Holiday treat! 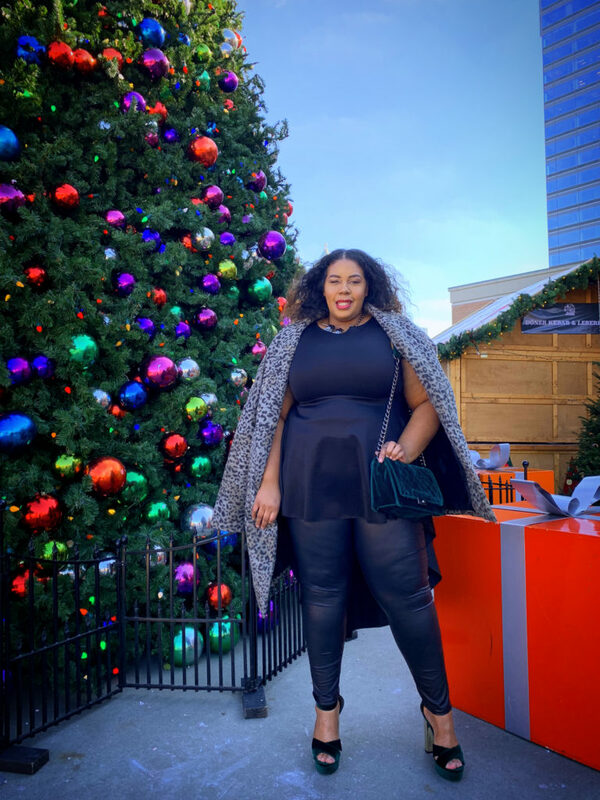 Jingle Bells, Jingle Bells…Run Errands While we SLAY!!!! Pair your Faux- Leather leggings with your Favorite hoodie, sneakers and top off with a Luxe looking coat for a effortless athleisure look! I chose my go-to Adidas Hoodie and sneakers. 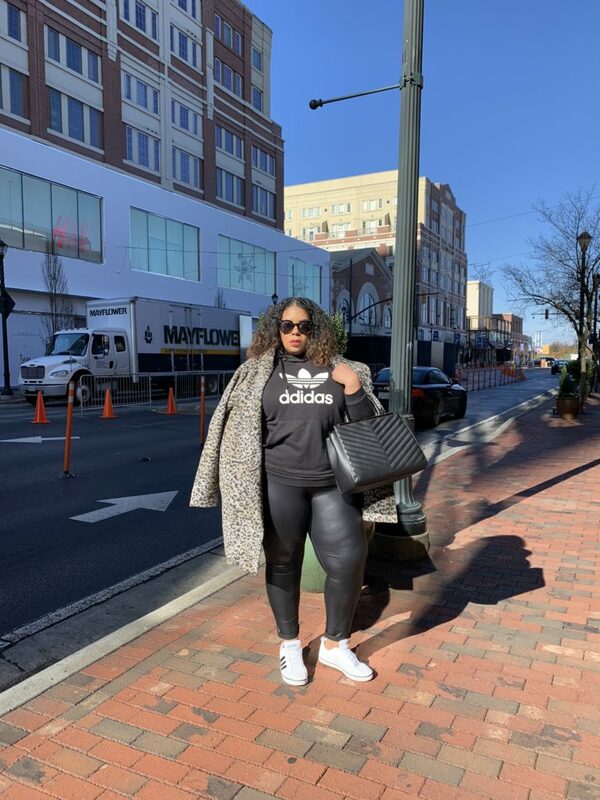 Topped it off with my Lane Bryant coat (Past season…but here’s a pretty alternative!) and a sophisticated “For Business or For Pleasure” bag from ShoeDazzle! The weather outside is frightful, But Shopping and Brunch is soooo Delightful! 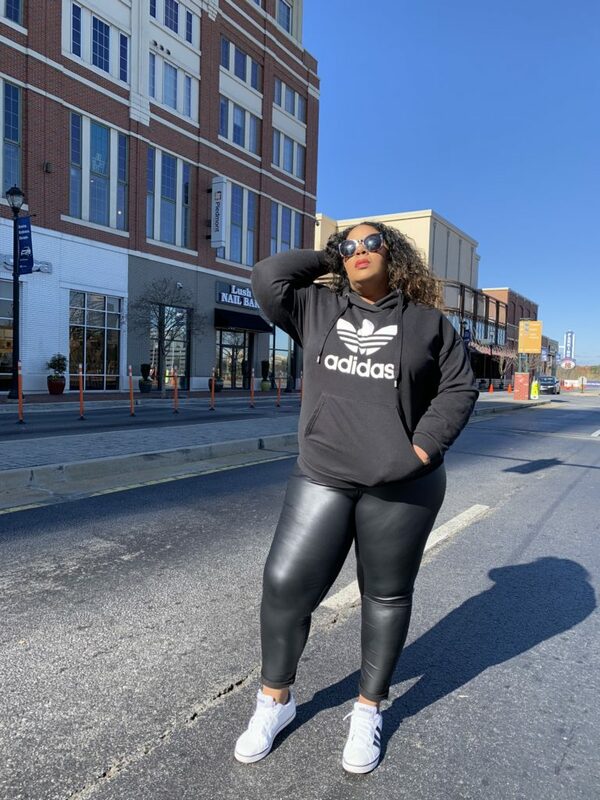 Weather your wrapping up your holiday shopping or having brunch with the girls, these leggings will keep you comfortable and ready for a long day in these streets! 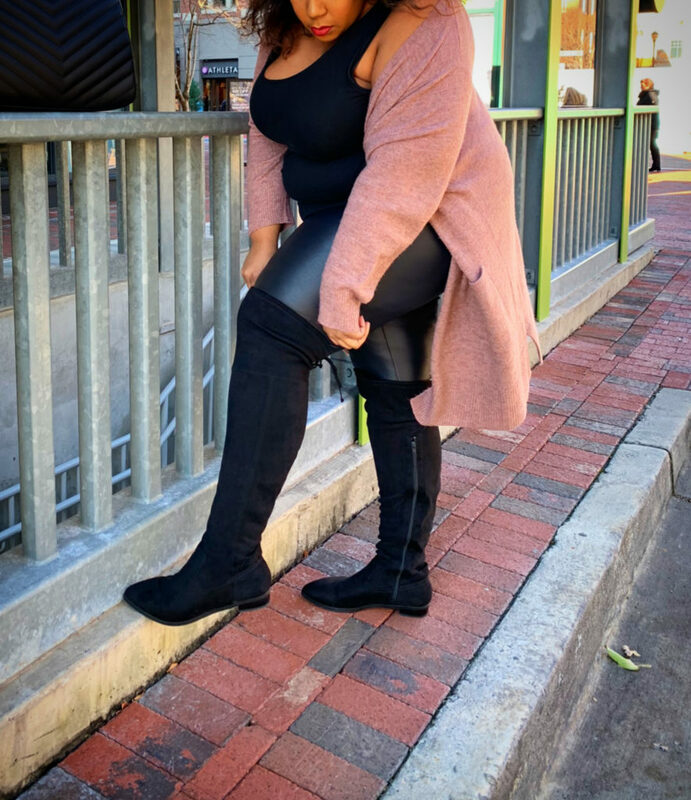 I paired them with a pair of Comfort View Flat Over-The Knee Boots, a black tank top and a super Soft Cardigan from Marshall’s! This look was topped off with a gray Jeweled Beret (Borrowed from my girl Rhonda <<<Follow Her! She’s Awesome!!) and same bag! They were the perfect additions to complete this look! I really CAN SLAY!! Baby It’s cold outside! Holiday parties are almost inevitable! Don’t want to wear a dress? I got you boo! 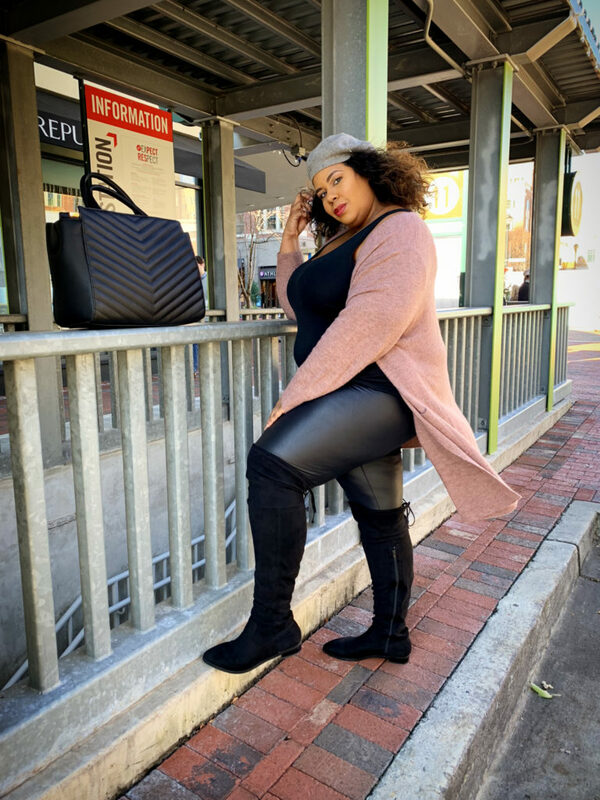 Pair….yeah you guessed it…the same Faux-Leather leggings with a cute top and some fancy heals or boots for a sleek, sophisticated look! Toss that Diva coat over your shoulders and let the party begin! (Pssstttt!! Top was a past season find from Exquisit Pink Boutique , here is s similar Dress/TOP AND you can save 15% off your purchase with the Code “Lux”) The Green Velvet Bryce Glam Platform are surprisingly past Season BUT THEY BROUGHT THEM BACK FOR THIS SEASON!!! I was Shooketh! LOL! 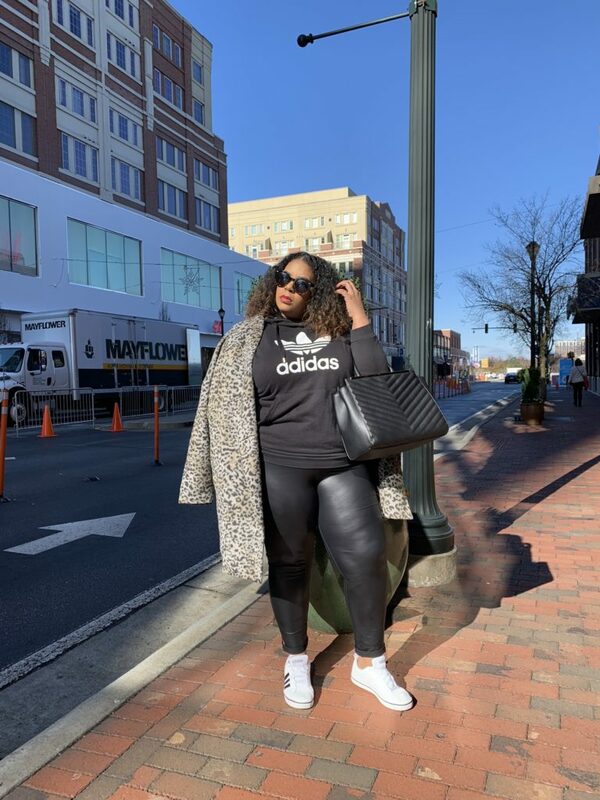 The Lane Bryant coat topped it off!! And the shoes! (Yeah…I have a lot of stuff in my closet Dolls….but you already know that! LOL! 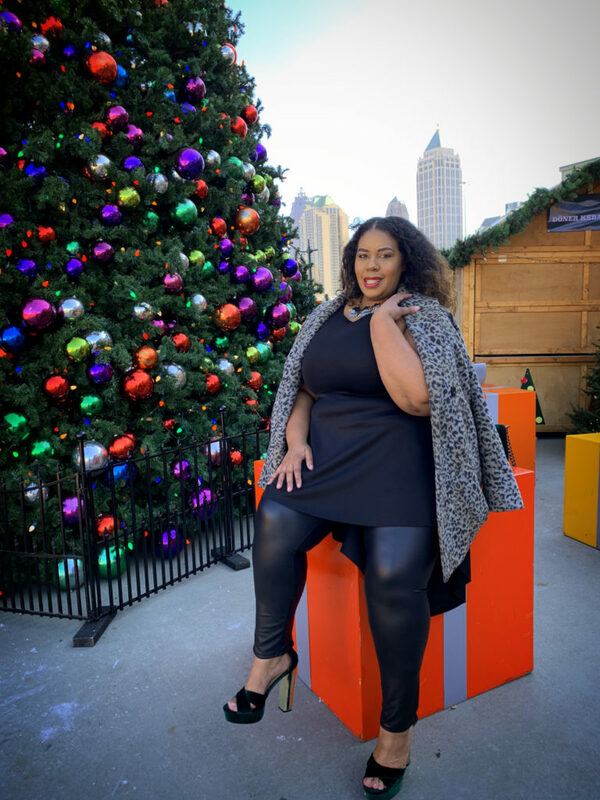 So from errand running realness to Holiday party Slays, these fabulous legging have you covered! Please don’t forget to check out DivaLux for all your DIVA Needs! Visit their site and use a special coupon code “LuxePlus10” and save 10% off your purchase!! SCORE!!! They have lots of pretty dress options for the holidays (And everyday….) as well as separates and accessories! Meet me in the comments below and tell me what’s your favorite look!!! Till next time Luxe Babes! 3 Tips on how to be stress free on Black Friday! 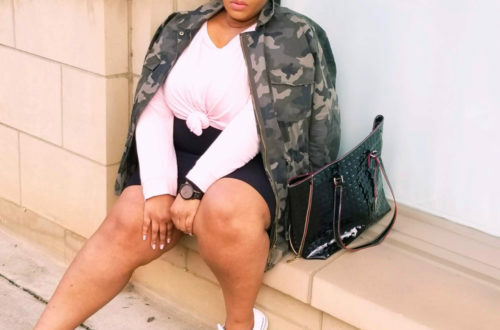 3 Tips on how to shop at Rainbow as a Plus Size Woman! champions league song download on Did you miss my New York and Company Haul?? 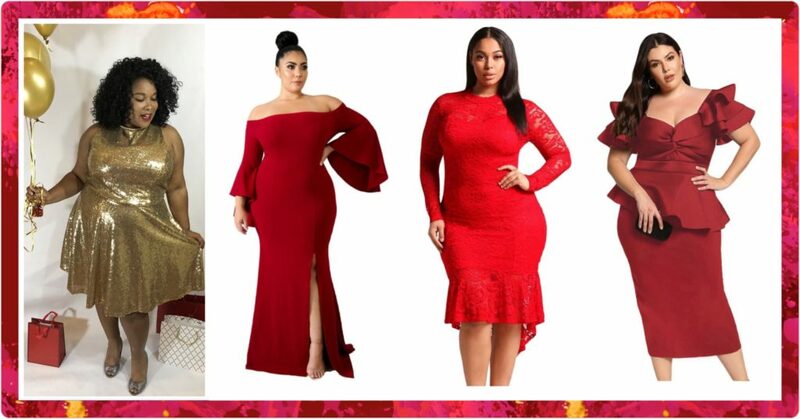 Catherine (Sunny) on 3 Tips on how to shop at Rainbow as a Plus Size Woman!